Create bright cityscapes and glowing creatures with these building blocks that light up as you play. Build some bright ideas with this ingenious, illuminated set of interlocking construction blocks. Just add blocks to the base (battery or usb powered), and each one lights up when connected! Compatible with other construction block systems of the same size, this set of 36 or 102 blocks will inspire endless creativity in kids and grown-up geeks alike. It makes amazing sculptures of geometric light, in four modes (always on, 15 min. auto-off, flashing, and fading). 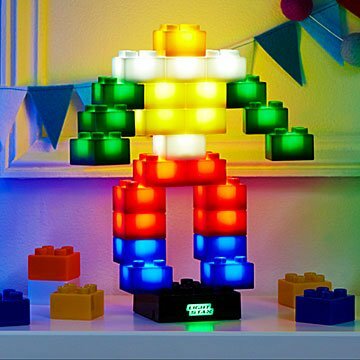 Build your own custom nightlight, skyscraper, glowing robot, or anything that lights up your imagination. Made in China. Compatible with Lego Duplo blocks. My son (and husband) love it! This lamp is fun, but also bright enough to be practical. It's hard for a grandparent who doesn't see his grandkids often to buy them gifts. I've found uncommongoods to be a good source of items not found easyly in stores and very easy to shop. Night light in grandson's loft. He can change it up whenever he wants to. This was a great gift- one of the favorites under the tree. I opted for the smaller set and found these to be more than adequate. I do think the base could be a little bit bigger but it has not been an impediment to building and fun yet. They light up really nicely (bright) although we haven't tested the USB option yet. I hope in future iterations they will expand their color palette beyond primary colors to include some more fun options. Great gift! I would recommend this fun toy! These are great for kids. The blocks are easy to manage and the lights are bright. My nephew, his father, and his sister were all playing with this. From the minute it was opened it was hit. All three of my kids (23, 27, 29) loved it and played with it. Great and unusual gift, wish I had bought three.